I have to be honest, with a scoop of vanilla ice cream on top, this French toast could easily pass as dessert. 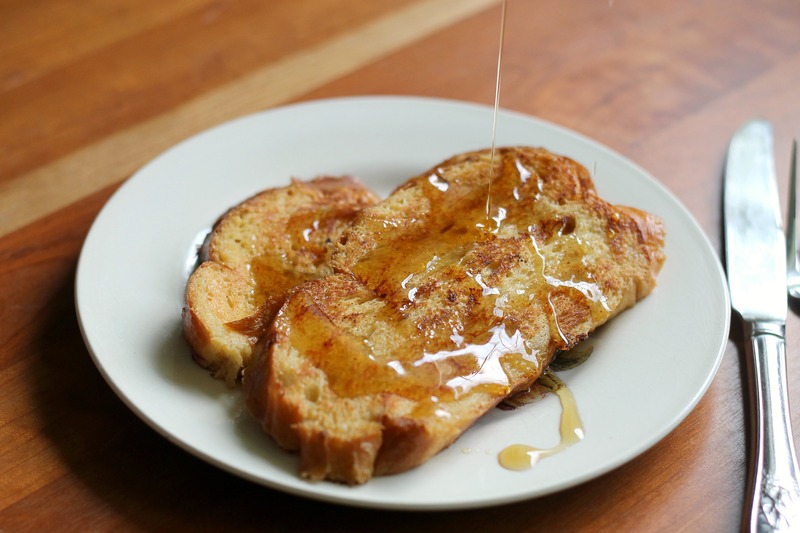 This is our favorite recipe out there for French toast, although we rarely make it because it’s not a very healthy way to start the day! However, when we do make it, it is so worth it! This French toast is slightly crisp on the outside, but almost like custard inside. This recipe calls for egg yolks instead of whole eggs in the soaking liquid, which makes it extra creamy, and calls for whole milk. It has a lot of vanilla in it (a whole tablespoon per batch) and cinnamon, plus some melted butter. Yes, this stuff is good! 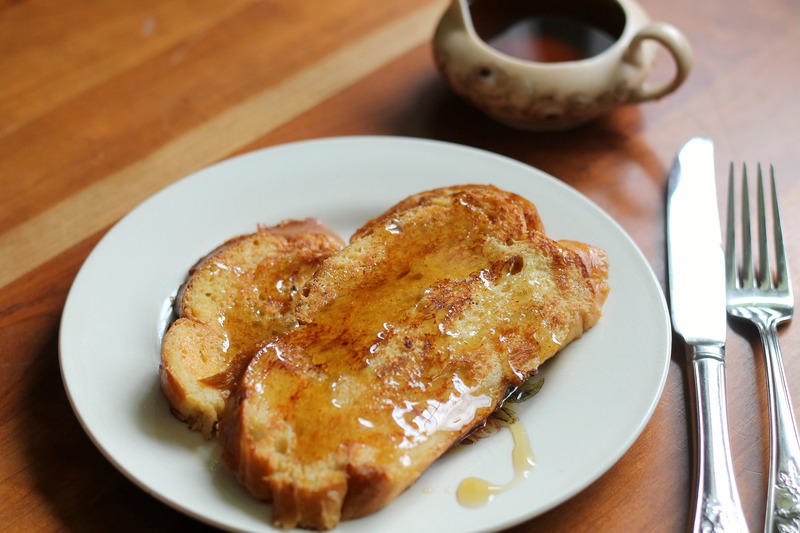 We use challah bread for our French toast, and our favorite kind is from Whole Foods, but you can use any sort of sturdy-ish bread. Serve this someday as a special breakfast treat (maybe with some fresh fruit on top) and we guarantee you will love it! Adjust the oven rack to middle position and heat oven to 300 degrees. Place bread on wire rack set in a rimmed baking sheet. Bake the bread until almost dry throughout, about 16 minutes (flip slices halfway through). Remove the bread from the rack and let cool for 5 minutes. Whisk milk, egg yolks, sugar, 2 tablespoons melted butter, vanilla, cinnamon, and salt in a large bowl until well blended. Transfer to a 13 by 9-inch baking pan. Soak bread in the milk mixture until saturated but not falling apart, about 15-20 seconds per side. Pick the bread up with a spatula, allow excess milk mixture to drip off, and place on a large plate. Repeat with remaining slices. Melt 1/2 tablespoon butter in a 12-inch skillet over medium-low heat. Using a slotted spatula, transfer 2 slices of soaked bread to the skillet and cook until golden brown, about 3 to 4 minutes. Flip and continue to cook until the second side is golden brown, another 3 to 4 minutes. Repeat with remaining bread, adding 1/2 tablespoon of butter to the skillet for each batch. Enjoy!